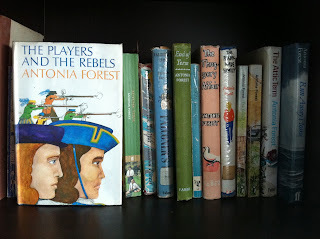 This, the second of the two historical novels from Antonia Forest's Marlow books, is a somewhat darker beast than its companion The Player's Boy. 'The times they are a-changing', as the song once said. Elizabeth I is aging, the political intrigue as would-be successors jostle for position around her creates a tense and volatile climate - both at court and in London itself. The Chamberlain's Men teeter, with all the other companies, on the brink of a constant threat of closure - plays that once seemed innocuous, are now being read as portrayals of actual events; fictional characters, portraits of those around the Queen; intricate created plots as possible treason. Nicholas' friendship with Humphrey Danvers, page to Harry, Earl of Southampton continues, and they still meet at St Paul's Yard on Sunday mornings if they're both free to do so. Will Shakespeare, unobtrusive, but aware of the friendship, cautions Nick, suggesting it might be less than wise to continue the association, times being what they are, particularly when Nick, stumbling, says more than he should, alerting Will to information Nick has that could be compromising. Nick refuses to divulge the conversation he's previously had with Humphrey about a letter Humphrey saw - which he should not have seen - from the Queen to Lord Essex, and the betrayal to come of Harry Southampton, with which Humphrey is struggling. To distract Will, Nick brings up the idea he and Humphrey had hatched at the time, while Humphrey was casting around wondering what he would do if he were no longer Harry's page. his face wearing the composed expression Nicholas had learned to distrust, to say briefly, as he changed, that a different play was required for St Stephen's Night: and it wasn't until the spectators had gone that the Company learned that they were to perform Troylus and Cressida ... for the Court's edification as a lively Homily against the courses pursued by the Earl of Essex. Will faces down the consternation of the company, many of them sympathetic to Essex's aspirations to the throne (against the alternative of Scottish King James), well aware that while the play was written based on the old story of Troy, and had never been intended as a parallel to current events, it is all too clear that that parallel is being drawn by Hunsdon. It's a perilous undertaking for the Company, as Nick pertly reminds Will - recalling their conversation about misplaced loyalties, which Will ruefully acknowledges - confessing that during his protestations against doing the play, he'd gone so far as to mention having once had Southampton as his patron... The rest of the Company are horrified, despite their own sympathies, seeing only to clearly how clearly Will has exposed himself. However, a royal command is a royal command, and a copy of the play - long not performed - has to be found and rehearsed for the Court. Will is caught between old loyalties and the survival of the company, saying that to refuse didn't just mean losing the Court performance for St Stephen's, it could put each and every one of them at risk. As he says, his obligation to Southampton is his concern only, and not the Company's. "But mightn't you," said Nicholas, inspired, "tell Lord Southampton you never meant Patroclus to stand for him?" "Then instruct me how I word my assurance - Right Honourable - In one of my poor plays I have written an effeminate coward whom I fear many take to be yourself? I doubt that would help." Nicholas coloured. Edmund said kindly, "Silly boy." Nicholas took this in: he realised suddenly what it implied. "Will - that must be a great compliment! Aren't you -?" "Naturally," said Will sedately, "I am pleased to be asked." Nicholas looked at him. After a moment he saw he was more than pleased: he was triumphant as a soaring falcon: whatever it was he'd hoped, and worked, for these past years, he had it now. "That we're sublime! Why? What should he think?" "Only that in Italy women play the women's parts." "Women?" said Nicholas, scandalised. "Are they any good?" "They're said to be as good as you boys." "Truly?" Nicholas found this to be most unlikely: not to say improper: fancy embracing a woman on stage at the Globe! He could imagine the groundling's reaction to that - "Would you have women players?" "There'd be the one great advantage that their voices don't crack. But that aside, they'd surely make more stir than they'd be worth -"
I love this conversation - it conjures up all those great female Shakepearean women actors of our time - Judi Dench for one - and what we may not have if our theatres today were restricted as they were then, by religious and social codes long gone. Interestingly, in European opera cross-dressing often happened in reverse: boys and young men were played by women, mezzo sopranos often, for the lower pitched, but youthful sounding voice. Think of Mozart's Cherubino, Handel's Sextus and Annius, and then later, Richard Strauss's Octavius. Will's comments in this conversation are, unknown to him, prophetic. Nicholas' voice has begun to break. Cast as Twelfth Night's Viola, 'the best of all Will's girls', he is in agony lest the Company discover and put him out of the play. With massive effort he is managing to hide it, well aware that at any time, his voice could betray him and destroy the performance. To add to his stress, Humphrey has finally agreed to write some airs for the new play and Nick is in an agony of worry lest Humphrey fail, again, to come through. He doesn't. He arrives with his song; Armin, the musician, likes it, asks for another and Humphrey has stepped up, and made himself, potentially, of value to the Company. ...Burbage said, "You unspeakable little wretch! You hardly deserved to get through as you did!" I know it," said Nicholas radiantly. "Your pardon, Dickon!" "Pardon! What your doom would have been if you'd ruined it, I hardly care to think!" "Nor do I and that's a fact!" "And I mayn't even have the satisfaction of saying Don't you ever do that again... You were excellent Nick. If it hadn't been so plainly John's [Hemming, playing Malvolio] night, it would certainly have been yours." ...a west country voice said, in amused recognition, "Why - it's the page - the lady disguised." He stared into the dark eyes, quite speechless. And then, behind him, Will's voice said ruefully, "A lady whom time has surprised. From now on, he must play the man." They stared at one another a moment longer: and perhaps Ralegh saw something in the boy's face to which, in London, he was unaccustomed: for he said, without mockery, "I'm sure he'll do so", smiled down at him, and went on towards the palace. "It's time," said Will, amused, breaking in after a while on Nicholas' wordless rapture as they walked down to Whitehall Stairs, "you tried your hand at answering back on your own account. Suppose - which isn't likely, I'll admit - the Queen were to throw you a word. She'd want a quick answer: worshipful but mute wouldn't do for her." Now, Nick's time in the Company is limited. It is customary for the boys to take themselves off and do something else until their voices settle and then, if they've a mind to, return and become adult players. Not wanting to return to Trennels, despite his promise to Will, Nick casts around in his mind for alternatives. He has until the Company shuts down for Lent, prior to leaving for its summer of touring to decide and in the meantime, things are becoming very tense politically. Unwittingly, in seeking to save Humphrey, Nick becomes caught up in Essex's plot to overthrow the throne. He is trapped, with Humphrey, in Essex's house, where they've gone to retrieve Humphrey's lute, when it surrounded by the Queen's forces after the plot is discovered. Only the generosity of a young soldier who finds them hiding behind a stack of books allows them to escape into the grounds. Scaling the wall, they find themselves face to face with Robin Poley, the government spy with whom Nick arrived in London all those years ago. Nick has only a moment to act; he pulls his sword and faster than he could ever have believed it in real life - his only duels having been previously on stage - Poley lies dead in the lane. The boys flee. Nick takes Humphrey to Will and their story is told. Will adapts it for the Company, to protect everyone, and Humphrey is handed to Armin to become the musician's boy. ...if the entire play had held the mirror up to poor Lord Essex, they could have borne it better: it was the way the rebel lines came by fits and starts that made it so unnerving. But the Court stayed silent behind a baffling wall; the Queen gave no sign of offence: the lines' ambiguities, seemingly, were audible only to themselves. to have proved most royally- "
and at last, without warning, the interruption came. The Queen's hands thumped down on the arms of her throne and she cried out, half-pain, half-anger: had she indeed been inattentive before, she was not so now. "Speak on," breathed Will to the all-too-visibly shaken Fortinbras, "-and for his passage-". But Fortinbras was voiceless: he admitted later that even had his lines not been wiped clean from his mind, he'd have been too terrified to speak them. The silence lasted. "You" whispered Will to Nicholas. Go" he commanded, and his voice just held, "bid the soldiers to shoot." It is Edmund, off gallivanting with the ladies, who returns, very shaken, to tell the rest of the company, who have been holding a vigorous post-mortem about the play, that the Queen came to the performance straight from signing Lord Essex's death warrant. Whether or not Elizabeth I did watch the first performance of Hamlet immediately after signing Essex's death warrant...well, I don't actually know. Within the context of actually history, it may not be accurate, but within the context of the novel, it is brilliant storytelling. This is such a long post already, the temptation to include the many pages of narrative interspersed with quotes from the play had to be resisted, but the tension Forest builds is incredible. I've read this book many, many times, and when I get to this bit I am, always, on the edge of my seat by the time I get to the quote above. I've selected more quotes this time - it's very hard to know what to choose, because it's all so good! The dialogue, while correct for the period in style, snaps; the characters become familiar and real; Forest's ability to mix historical fact seamlessly with fiction is even more obvious for the lack of any sense of jarring; and at bottom, this is a rollicking good story! The books stand for themselves, almost anything I could say about them would be superfluous, because I've already raved about them, and will only continue to do so!! As I will continue to encourage you to try and track them down for yourselves! As is the case with all these books, these two and the modern series, getting to the end is tragic because there are no more... Nick, who has to go away for a time, ends up meeting up with his old Grammar friend, Sam, who has joined the navy. It's one of those entirely believable weird coincidences, that happen all too often in life. Sam's ship is to sail on the tide, and looking at his options, Nick makes the sudden decision to sail with him - after all, he has to do something with himself for a year or so. He writes to Will to say where he's going, gives the letter to the boatmen he knows who are drinking in the same pub to deliver, goes aboard with Sam, and that's the last we hear of him. Never concern yourself with the length of a post; the fruit isn't ripe until it's ripe! Words of wisdom, as always Jack! Thank you.